Excellence in customer service is the hallmark of success in service industries and among manufacturers of products that require reliable service. But what exactly is excellent service? It is the ability to deliver what you promise, say the authors, but first you must determine what you can promise. Building on seven years of research on service quality, they construct a model that, by balancing a customer's perceptions of the value of a particular service with the customer's need for that service, provides brilliant theoretical insight into customer expectations and service delivery. For example, Florida Power &amp; Light has developed a sophisticated, computer-based lightening tracking system to anticipate where weather-related service interruptions might occur and strategically position crews at these locations to quicken recovery response time. Offering a service that customers expect to be available at all times and that they will miss only when the lights go out, FPL focuses its energies on matching customer perceptions with potential need. Deluxe Corporation, America's highly successful check printer, regularly exceeds its customers' expectations by shipping nearly 95% of all orders by the day after the orders were received. Deluxe even put U.S. Postal Service stations inside its plants to speed up delivery time. Customer expectations change over time. To anticipate these changes, Metropolitan Life Insurance Company regularly monitors the expectations and perceptions of their customers, using focus group interviews and the authors' 22-item generic SERVQUAL questionnaire, which is customized by adding questions covering specific aspects of service they wish to track. The authors' groundbreaking model, which tracks the five attributes of quality service -- reliability, empathy, assurance, responsiveness, and tangibles -- goes right to the heart of the tendency to overpromise. By comparing customer perceptions with expectations, the model provides marketing managers with a two-part measure of perceived quality that, for the first time, enables them to segment a market into groups with different service expectations. Service quality is a central issue in America today. In a recent Gallup survey, executives ranked the improvement of service and tangible product quality as the single most critical challenge facing U.S. business. It used to be that we were good at growing things. We still are, but with virtually no people involved. Agricultural employment has gone from well over half of all jobs to about 2% of them. It used to be that we were good at making things. We still are, but with very few people involved....Today, only 9% of American workers actually labor in factories. Yet, we have created millions of jobs....It's not surprising that what these people are doing instead of making things is providing services. Virtually all organizations compete to some degree on the basis of service. It is difficult to name even one industry for which service matters are unimportant. Study the strategies of manufacturing companies such as Ford Motor Company or Corning Glass Works and what you find is a paramount role for service. Indeed, as the decade of the 1990's unfolds, more and more executives in manufacturing firms will be as keenly interested in service quality as executives in banking, health-care, and transportation businesses are today. As manufacturing executives find it increasingly difficult to establish sustainable, technology-based competitive advantages, they will direct added attention and resources to value-added service as a truer source of superiority. And as manufacturers compete more on service, there will be less distinction between manufacturing and service businesses. It will take hard and dedicated work not to dissipate our broadbased lead in services, as we did in manufacturing. Many of the same causes of lost position are beginning to appear. Daily we encounter the same inattention to quality, emphasis on scale economies rather than customers' concerns, and short-term financial orientation that earlier injured manufacturing. The central role for services in the American economy is a key factor behind service quality's rising prominence as an institutional and societal issue. Services are so much a part of what we produce, consume, and export in this nation that it would be surprising if we weren't concerned about quality. A second factor behind service quality's rising prominence is that superior quality is proving to be a winning competitive strategy. McDonald's. Federal Express. Nordstrom. American Airlines. American Express. L. L. Bean. Domino's Pizza. Disney World. Club Med. Deluxe Corporation. Marriott. IBM. In every nook and cranny of the service economy, the leading companies are obsessed with service excellence. They use service to be different; they use service to increase productivity; they use service to earn the customers' loyalty; they use service to fan positive word-of-mouth advertising; they use service to seek some shelter from price competition. Service excellence pays off richly for reasons we develop in more detail later in this chapter. With service excellence, everyone wins. Customers win. Employees win. Management wins. Stockholders win. Communities win. The country wins. How do we explain the incongruity that service excellence pays off and yet is in such short supply? The signs of indifferent, careless, and incompetent service in America are everywhere. In a national banking study, three out of ten consumers recall a service problem at their current or former financial institution, typically an error of one kind or another. More than half of those recalling problems deemed them serious enough to switch financial institutions or to close accounts. In an Atlanta Journal and Atlanta Constitution survey of readers, 91 percent of the respondents said that quality of service had declined over the previous 20 years. Wrote one reader: "The animals are running the zoo." Time magazine recently devoted a cover story to the service problem, claiming that "Personal service has become a maddeningly rare commodity in the American marketplace." The Wall Street Journal, in a story about health-care service, stated: "The problems are manifold: Bad diagnoses. Unnecessary surgery. Over prescribing or misrepresenting drugs. High rates of hospital infection. Lab-test errors. Faulty medical devices. Alcoholic or drug-addicted doctors." Lowell Levin of Yale University's medical school advises surgery patients to use a magic marker to indicate just where on their bodies the surgery is to be done, claiming his advice wouldn't sound ridiculous if people only knew how often mistakes do occur. Poor selling saved me $48,373 in 1983. That year, I decided I would not buy anything I didn't need unless someone sold it to me. Whenever I found something I wanted, but didn't encounter sales persuasiveness, I did not buy. By the end of the year, my savings total was $48,373. The research that we present in this book documents the central role that leadership plays in delivering excellent service. We have seen firsthand how strong management commitment to service quality energizes and stimulates an organization to improved service performance. We have seen firsthand how role ambiguity, poor teamwork, and other negatives fester in a rudderless, leaderless environment, sapping an organization's service quality. True service leadership builds a climate for excellence that prevails over operational complexities, external market pressures, or any other impediments to quality service that might exist. Mediocre service in America is common, but it is not a given. In every single industry we have examples of companies delivering superb service. Excellent service is not a pipe dream; it is possible to overcome the conditions that foster service mediocrity. The key is genuine service leadership at all levels of an organization -- leadership that offers the direction and inspiration to sustain committed servers. Managing is not enough. Service work can be difficult and demoralizing. Customers can be rude. Company policies can be suffocating. Sheer numbers of customers to serve can be overwhelming. End-of-the-day fatigue can be desensitizing. Over time many service employees get "beat up" by the service role and become less effective with customers even as they gain technical experience that should produce the opposite result. It was not the story line...that left its mark on me. It was the description of the social atmosphere through which the characters moved. All who lived under the big top -- the freaks, the acrobats, even the animals -- were real to each other. Everyone else -- specifically anyone in the audience -- was a "flatty." ...I recalled how I had despaired, during a brief stint as a ticket agent during World War II, over the futility of trying to give individual attention to the masses of rail travelers clamoring to get somewhere...and I remembered the irritation I had felt when the crowds became unmanageable at several counter jobs I had held in my youth. There had been times when it seemed the only salvation was to retreat from involvement with individuals and to devote my attention exclusively to the specifics of the job at hand. When I did this, the customers became two-dimensional nonentities without personality or feelings....At the time I had not referred to them as flatties but oh how descriptive was the term when I encountered it....Even though I had treated people that way -- often considering it businesslike -- I realized that I had always resented being treated as a flatty! Few of us, like Carr, wish to be treated as a flatty by service providers. Few service providers, again like Carr, begin a new job treating customers in this way. Robotlike service traits almost always develop on the job. People in service work need a vision in which they can believe, an achievement culture that challenges them to be the best they can be, a sense of team that nurtures and supports them, and role models that show them the way. This is the stuff of leadership. In their book, Leaders: The Strategies for Taking Charge, Bennis and Nanus point out that the principal distinction between leaders and managers is that leaders emphasize the emotional and spiritual resources of an organization, its values, and aspirations, whereas managers emphasize the physical resources of the organization, such as raw materials, technology, and capital. The root cause of our quality malaise in America today -- the reason service isn't better than it is despite the fruits of excellent service -- is the insufficiency of service leadership. Too many service workers are overmanaged and underled. Thick policy manuals rule management's belief in good judgment of frontline servers. Memoranda from above supersede face-to-face, give-and-take dialogue with employees. The goal of profit takes precedence over the goal of providing a service good enough that people will pay a profit to have it. To materially improve service, we must devote more energy and attention in our businesses and business schools to the development of leadership values and capabilities. Otherwise, the temptation of service mediocrity will continue to win out over the promise of service excellence. 1. Service vision. Service leaders see service quality as a success key. They see service as integral to the organization's future, not as a peripheral issue. They believe fundamentally that superior service is a winning strategy, a profit strategy. Regardless of the markets targeted, the menu of services offered, or the pricing policies followed, service leaders see quality of service as the foundation for competing. Whatever the specifics of the vision, the idea of service excellence is a central part. Service leaders never waver in their commitment to service quality. They see service excellence as a never-ending journey in which the only effective option is to plug away toward better quality every day of every week of every month of every year. They understand that service quality is not a program; that there are no quick fixes, no magic formulas, no quality pills to swallow. Service leaders understand that service excellence requires a full-court press -- all of the time. They understand that a company cannot turn the service issue on and off like a water faucet. As L. L. Bean, Inc., President Leon Gorman states: "A lot of people have fancy things to say about customer service, including me. But it's just a day-in, day-out, ongoing, never-ending, unremitting, persevering...type of activity." 2. High standards. True service leaders aspire to legendary service; they realize that good service may not be good enough to differentiate their organization from other organizations. Service leaders are interested in the details and nuances of service, seeing opportunities in small actions that competitors might consider trivial. They believe that how an organization handles the little things sets the tone for how it handles the big things. They also believe that the little things add up for the customer and make a difference. This is why Jim Daniel, CEO of the Friendly Bank in Oklahoma City has the bank's lobby floor polished daily. And why Robert Onstead, CEO of Randall's Food and Drugs in Houston, insists on lighting his parking lots so brightly that "customers could read newspapers in the parking lots at midnight if they wished to do so." Once I make a commitment to a customer or another associate, I promise to fulfill it on time. I will do what I say when I say I will do it....I understand that one claim or one mistake is one error too many. I promise to do my job right the first time and to continually seek performance improvement. 3. In-the-field leadership style. Service leaders lead in the field, where the action is, rather than from their desks. They are visible to their people, endlessly coaching, praising, correcting, cajoling, sermonizing, observing, questioning, and listening. They emphasize two-way, personal communications because they know this is the best way to give shape, substance, and credibility to the service vision and the best way to learn what is really going on in the field. Service leaders also employ their hands-on approach to build a climate of teamwork within the organization. They challenge the organizational unit to be excellent in service, not just the individual employee, using the influence of their offices to bring the team together frequently for meetings, rallies, and celebrations. Sam Walton, the founder and chairman of retailing giant Wal-Mart Stores, Inc., practices in-the-field leadership as well as any senior executive in America today. Walton and other top Wal-Mart executives spend most of their time each week visiting stores, spreading the gospel, and listening to the sounds of the business. Each Friday the Wal-Mart management team reassembles in the Bentonville, Arkansas, headquarters for mandatory meetings in which they share insights from the field. On the next day several hundred headquarters personnel and managers visiting from the field come together in Wal-Mart's famous Saturday morning meeting, a potpourri of results reporting, plans presentations, cheers, hoopla, homespun philosophy, recognition of outstanding performers, bantering, and exhortations for improvement personally led by Sam Walton himself. With its own communications satellite, Wal-Mart has the capability to broadcast the Saturday meeting directly to its stores. As securities analyst Joseph Ellis once remarked in a speech: "Wal-Mart operates like a small company in terms of how it communicates with its people." 4. Integrity. One of the essential characteristics of service leaders is personal integrity. The best leaders value doing the right thing -- even when inconvenient or costly. They place a premium on being fair, consistent, and truthful -- and, as a result, earn the trust of associates. As Peter Drucker writes: "The final requirement of effective leadership is to earn trust. Otherwise there won't be any followers -- and the only definition of a leader is someone who has followers." Service leaders recognize the impossibility of building a serviceminded attitude in an organization whose management lacks integrity. They recognize the interconnection between service excellence and employees' pride and understand that employees' pride is shaped in part by their perceptions of management fairness. When executives buy and sell companies as though they were cattle, demonstrating scant interest in what happens to employees and customers as a result; when they inflate prices and then quickly mark the prices down so they can use the term sale, when they train and script salespeople to use bait-and-switch, scare, and other unethical tactics to pressure customers to buy what they don't need -- these executives completely undermine their own credibility on the subject of service quality. Employees see for themselves that management cares not at all about servicing and satisfying customers. And most employees eventually ask themselves: "Why give my all to a company that lacks integrity? Why bust my chops for a company in which I do not believe?" As the phrase "the honest workman" suggests, workmanship is founded in personal integrity. Those imbued with it have nothing but scorn for sloppiness, shabbiness, cheapness, sharp dealing or false fronts. Thus if the instinct of workmanship could be stimulated throughout the population, it would affect far more than the economy. In a "quality society," honesty, excellence, and the principle of giving full value for what we receive would become the rule of conduct both in business and personal relationships. What began as an effort to improve quality could end in a revolutionary improvement in the overall quality of life. Service leaders, as we have just noted, fundamentally believe that high quality pays off on the bottom line. Many executives, however, are not so sure. Many executives are not yet convinced that hard-dollar investments to improve service will come back as profit gains. And these executives may be right. Investments to improve service may not come back as profit gains. Indeed, a lot of money is wasted in organizations every year in the name of quality improvement. From adding costly service features that are unimportant to customers to spending training money unwisely, it is quite common for organizations to throw money away pursuing better service quality. As a car-rental agent confesses: "The computer training was real good. I know how to do all this technical stuff, but nobody prepared me for dealing with all these different types of people." Actually improving service in the eyes of customers is what pays off. When service improvement investments lead to perceived service improvement, quality becomes a profit strategy. * In the short run, superior quality yields increased profits via premium prices. As Frank Perdue, the well-known chicken grower, put it: "Customers will go out of their way to buy a superior product, and you can charge them a toll for the trip." Consistent with Perdue's theory, PIMS businesses that ranked in the top third on relative quality sold their products or services, on average, at prices 5-6% higher (relative to competition) than those in the bottom third. * In the longer term, superior and/or improving relative quality is the more effective way for a business to grow. Quality leads to both market expansion and gains in market share. The resulting growth in volume means that a superior-quality competitor gains scale advantages over rivals. As a result, even when there are short-run costs connected with improving quality, over a period of time these costs are usually offset by scale economies. Evidence of this is the fact that, on average, businesses with superior quality products have costs about equal to those of their leading competitors. As long as their selling prices are not out of line, they continue to grow while still earning superior profit margins. Exhibit 1-1, from the PIMS data base, graphically shows the positive relationship between relative perceived quality and return on sales or return on investment. Excellent service pays off because it creates true customers -- customers who are glad they selected a firm after the service experience, customers who will use the firm again and sing the firm's praises to others. We should never let a customer leave the store unhappy because we look at each customer as a potential $50,000 asset. An average customer spends $100 a week on food shopping. That's more than $5,000 a year, and more than $50,000 over ten years. Customer service is big business when you look at the long-term picture. The essence of services marketing is service. Whereas the marketing textbooks stress the four Ps of marketing -- product, place, promotion, and price -- in a service business the most important competitive weapon is the fifth P of performance. It is the performance of the service that separates one service firm from others; it is the performance of the service that creates true customers who buy more, are more loyal, pay Frank Perdue's "toll for the trip," and who spread favorable word of mouth. Excellent service differentiates otherwise similar competitors in a way that is important to customers. Whereas competing service firms often look the same with similar facilities, equipment, and menus of services, these firms do not feel the same to customers. A genuinely warm greeting from a service provider or the graceful handling of a special request can help one firm seem very different to its customers than other suppliers of similar services. Thus, it is critical to make the distinction between services and service. Competitors commonly offer the same services and different service. That is why James Robinson, CEO of American Express Company, says: "Quality is our only form of patent protection." In effect, excellent service companies perform better on the bottom line because they perform better for their customers. Customers respond to these firms because they perceive more value in their offers than in competitive offerings. Value is the customer's "overall assessment of the utility of a product based on perceptions of what is received and what is given." The concept of value helps explain how companies with strong service reputations are often able to charge higher prices than their competitors. Customers have to expend more than money to use a service; they also have to bear nonmonetary prices, for example, time and psychic cost. These customers may be quite willing to assume more monetary cost to reduce nonmonetary cost and/or to obtain an otherwise stronger service. The PIMS data base shows that companies with high relative perceived quality have a cost of doing business that is similar to their main competitors. This is so even though quality improvement frequently involves increased investment in technology, marketing research, employee training, performance measurement, reward systems, and so forth. What drives down costs most significantly is market share growth. Companies with high market shares benefit costwise from scale economies. Companies with high market shares built through high quality benefit from these scale economies and from higher revenues due to heavy sales volume and premium prices. Quality improvement also leads to operational efficiencies beyond those associated with scale economies. The reality is that service errors and foul-ups add cost to the service delivery system. From computer time to fix account errors to more telephone lines to handle customer problems, service sloppiness steals from the bottom line. In the early 1980s, a Merrill Lynch & Company, Inc. task force concluded that the firm's direct cost of service snafus was $210 million a year. This included the costs involved in staffing departments dedicated to correcting problems and errors. Audits by Technical Assistance Research Programs, Inc. (TARP) at over a dozen financial service firms show that poor service and ineffective customer communications cause up to one-third of the total workload. I can't emphasize enough that quality is as bottom line as a company can get. This is as true in a service business as it is in manufacturing. For example, in our Card business, there is rework if errors are made in the first place -- if remittances are not processed, if billings are incorrect, if establishments are not paid on time, if Cardmember benefits are not properly communicated. All this generates inquiries and additional processing -- or what we call "avoidable input." Reducing avoidable input is the service equivalent to reducing rejects in manufacturing. The potential payoff from service excellence is considerable. Quality does pay. We know this from the PIMS research. We know this from the TARP research. We know this from the many companies we have worked with and observed closely over the years. And we know it from our own empirical research in service quality that we have written this book to share. 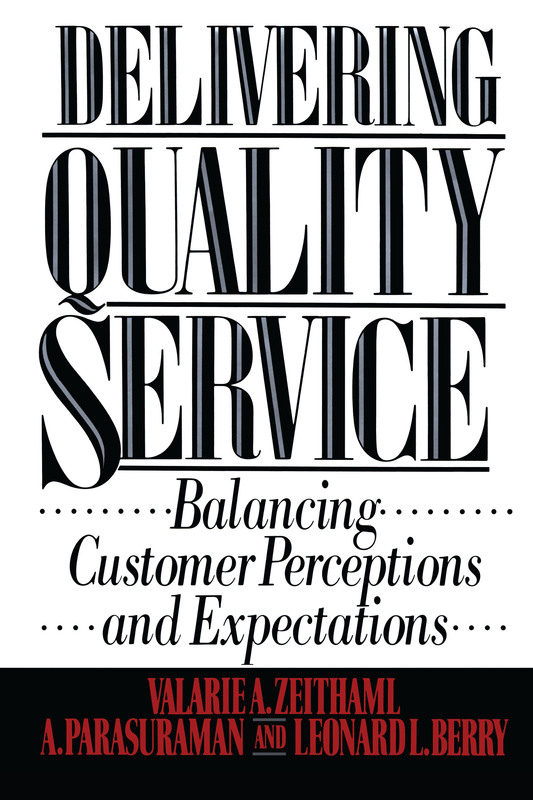 This book integrates the concepts, ideas, and findings that have emerged from an ongoing, multiphase study of service quality which we started in 1983. From this research, sponsored by the Marketing Science Institute in Cambridge, Massachusetts, we have developed a conceptual model of service quality and a methodology for measuring customer perceptions of service quality. We also have developed many ideas about what companies need to do to improve service quality. We use our model as a framework for the book as it provides a structure for understanding service quality, measuring it, diagnosing service-quality problems, and deriving solutions to the problems -- the very subjects an executive wishing to improve quality needs to entertain. We refer to the model as the gaps model because it features discrepancies or gaps that need to be closed to offer excellent service. In chapter 2 we develop the customer part of our model, defining the concept and dimensions of service quality. In chapter 3 we present the managerial part of the model, focusing on four gaps that cause service-quality problems. In chapters 4 through 7 we take a closer look at these four gaps; in each chapter we focus on the underlying reasons for a gap and make suggestions for closing it. In chapter 8 we offer suggestions on how to get started in a service-improvement effort, a challenge that often appears to be overwhelming. And in chapter 9, the final chapter, we discuss emerging service quality issues and challenges for the decade of the 1990's. The book's appendixes include descriptions of our research methods and our survey instruments.